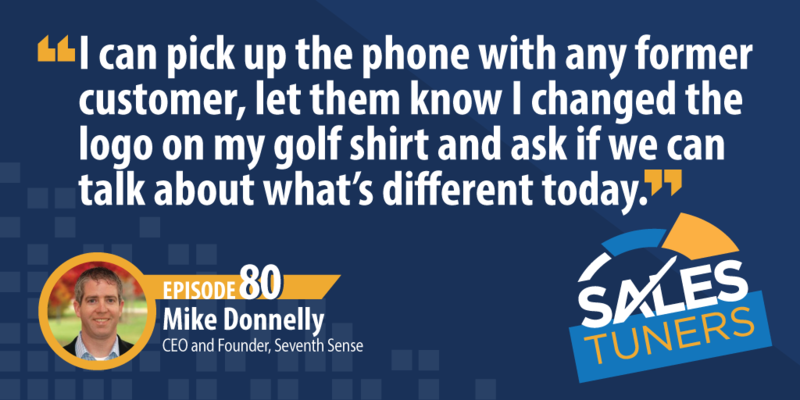 Mike Donnelly is the CEO and Founder of Seventh Sense, a precision email system analyzing existing data to determine the best time and frequency for outreach. Mike was an award-winning individual sales contributor at multiple companies personally generating more than $40 million in sales. During that time, he also got to experience two separate billion-dollar acquisitions. In college, Mike fell in love with writing code. After learning how to build products, it was natural for him to want to learn how to sell software. As he affirms, whether you’re an entrepreneur or a salesperson you are responsible for building your book of business. Instead of steamrolling ahead, Mike encourages reps to take a step back to understand where customers can have success and focus efforts on that demographic. Often, what he thought was important to his target audience was wrong. Instead, Mike takes the time to understand what matters before beginning a sales conversation. People are Creatures of Habit: Quit spending your mental energy trying to figure out when your prospects are more apt to respond or engage with you. Just like you have a routine, so do they. They likely get out of bed around the same time, commute into the office at the same time, and guess what — respond to emails and phone calls at the same time of day. Look for those patterns and learn to strike while the iron is hot. Practice Genuine Empathy: A lot of people talk about empathy, but most don’t practice it. What does it mean to truly understand a prospect’s challenges? Without trying to sell anything, sit down with a few of your ideal prospects and let them teach you. Ask them what industry struggles they’re having right now? Ask them how they are personally measured on initiatives. Ask them how they are compensated for success. These small nuggets can turn into a pile of gold. Be Willing to Walk Away: As excited as you are about what you sell, it’s not for everyone — at least not right away. Give your prospect the space to say “no,” but make sure you get permission to say “no” yourself if it’s the right thing to do. “No” doesn’t mean never and by leaning into that notion, you’ll create a level of trust most reps never get.